Q. Do you have any information on Charcoal briquets? In the early 1920s, at the urging of E.G. Kingsford, Henry Ford’s cousin by marriage, Ford purchased property in Michigan’s upper peninsula and built the Iron Mountain plant. The main purpose of this plant consisted of processing lumber to be used in building Model T body frames and other car parts. During the course of this manufacturing process, much wood waste was generated. 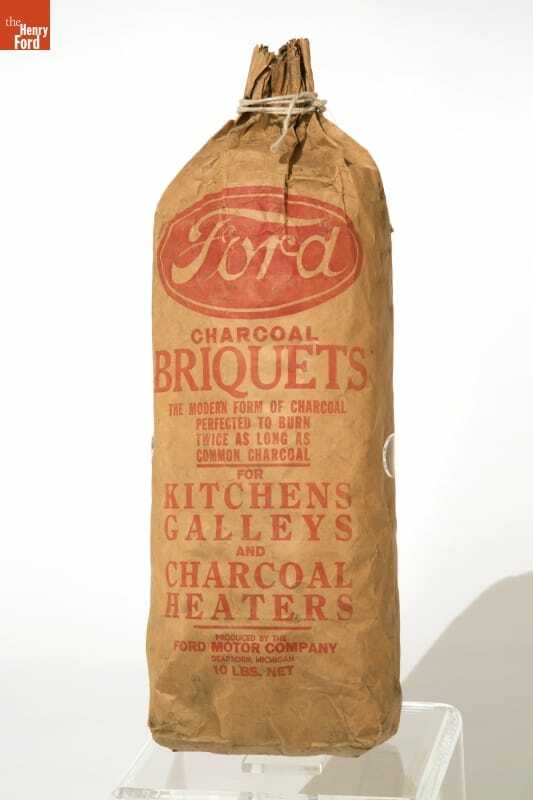 In an effort to salvage and commodify these waste materials, Henry Ford took the opportunity to produce and sell charcoal briquets. Henry Ford did not invent charcoal briquets, he just modified the charcoal manufacturing process by reducing and uniformly standardizing the size from a lump to a briquet. 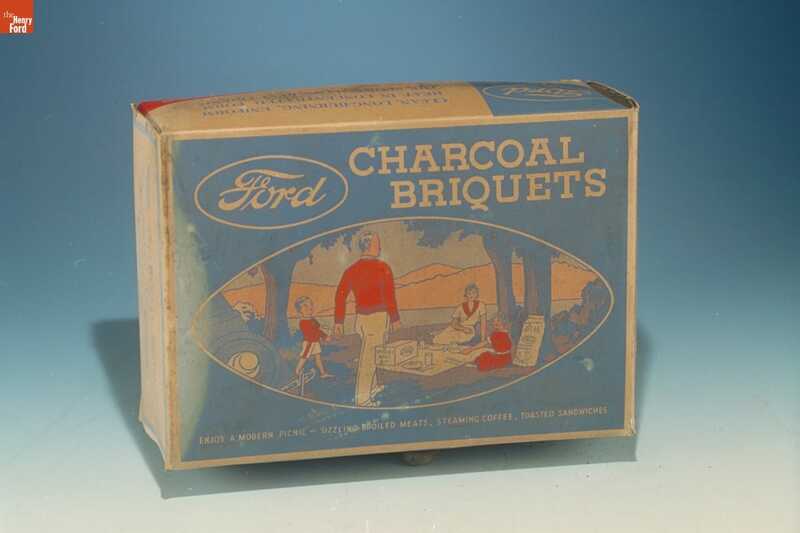 When Ford started to produce the briquets in 1924, other suppliers of charcoal had already been marketing their products for industrial and commercial purposes. Charcoal was already being used in foundries, workshops, hotels, restaurants, and in curing tobacco, as well as meat and fish in smoke houses. Ford Motor Company continued to market to these audiences, but expanded their campaign to include household utility. 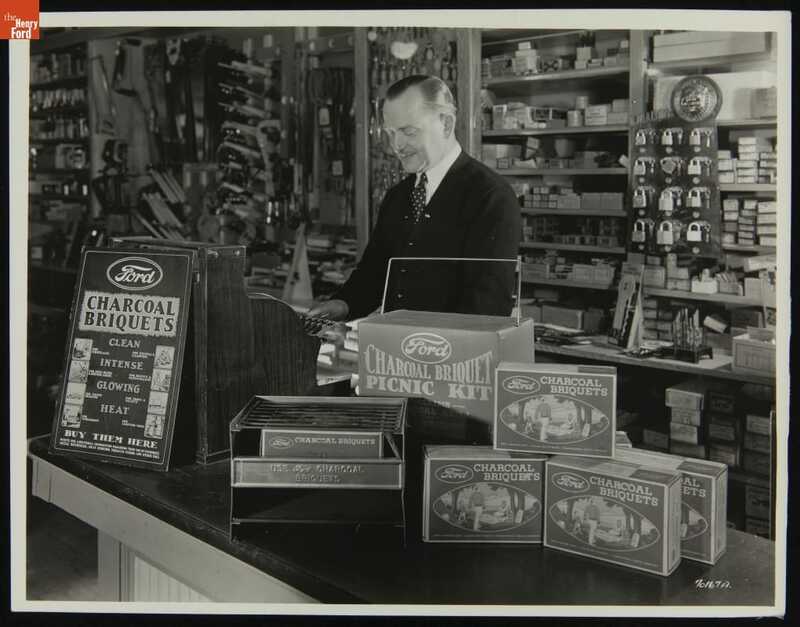 A small advertisement from the September 15, 1924 issue of the Ford News, states that, “Charcoal briquettes… can now be purchased at the Ford commissary stores, Highland Park. … They are suitable for use in fireplace grates, cooking ranges and as kindling for coal or coke fires in furnaces or base-burners". Then in 1932, Walter Stoepple, an employee at the Iron Mountain plant and an avid outdoorsman, developed the idea to create a campfire starter kit. The relatively simple package consisted of a shoebox sized cardboard box, 12 charcoal briquets, some pine cones and curled wood shavings. By 1935 the Ford Sales Department had spiffed up this package and was marketing the Ford Charcoal Picnic Kits at all Ford dealerships. Promoting camping and picnicking activities was a natural fit for Ford Motor Company because it facilitated the use (and therefore, purchase) of Ford vehicles for leisure activities. Briquets, picnic kits, and vehicles were all sold separately, and dealers were not required to sell one with the other. Even so, the sales of charcoal briquets remained popular and proved to be profitable for the company. In 1951, wood was no longer being used to build automobiles, so Ford Motor Company sold the Iron Mountain plant to the Kingsford Chemical company. This facility continued to make charcoal briquets, but under the name of Kingsford Charcoal, not the Ford logo. In 1961 the Kingsford Chemical company shut down the plant and moved its operation to Louisville, Kentucky.